Future-ish would like to welcome Paige, a new virtual greeter by UK-based Tensator, to the growing team of hologram virtual greeters that are guiding humans to their destinations around the world. Holograms have made many appearances in science fiction movies but not since Max Headroom have virtual human counterparts received so much attention. Paige is a new addition at the international gates at Dulles International Airport and, like any new employee, she is currently in her probationary period. Paige is the first virtual greeter in a US airport, on loan to the airport to evaluate the technology for use in things like directing passengers to destinations and providing information on forms required for travel. 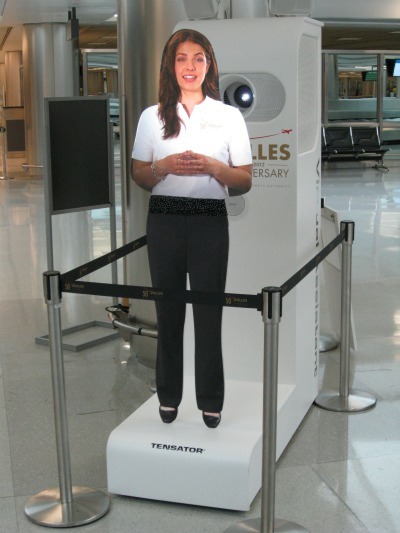 Other virtual greeters have been installed in airports around the world, as well as in a medical center and a large drug store...all to help humans move forward in a safe, orderly fashion. Essentially the next generation of queue control and management (farewell velvet ropes and stanchions), the technology is also a dynamic tool for delivering brand and promotional messaging. We expect to see many more virtual assistants and guides in the near future.